Gastrointestinal stromal tumors (GISTs) are known as one of the most common mesenchymal tumors in the world. According to the World Health Organization, the estimated incidence rate of gastrointestinal stromal tumors is 14.5 per million, and is prevalent in 129 people from a sample of a million, in the United States. Over the past decade, the understanding, awareness and treatment of GISTs has witnessed a tremendous progress. The pathophysiology of gastrointestinal stromal tumors is being studied actively across medical research institutes and organizations across the globe. Gastrointestinal stromal tumors account for less than one percent of all the GI tract tumors in the world. 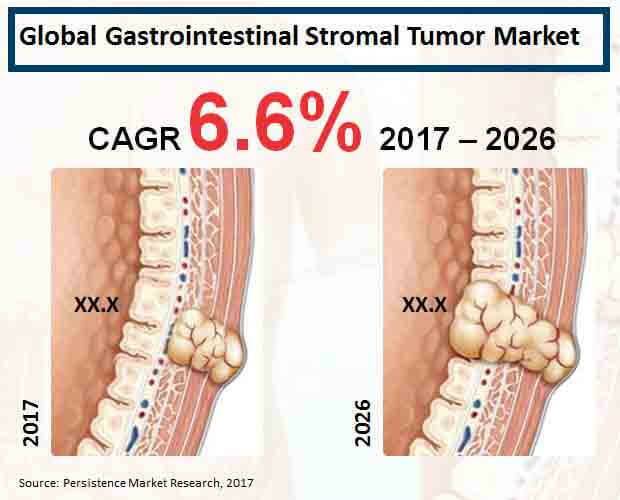 An exclusive study developed by Persistence Market Research projects that by the end of 2026, the global market for gastrointestinal stromal tumor will be worth over US$ 1.5 Bn. During the forecast period, 2017-2026, the global gastrointestinal stromal tumor market will expand at a robust CAGR of 6.6%. Being benign, at most times, gastrointestinal stromal tumors may occur in all parts of the gastrointestinal tract. Yet, the stomach is the most common localization for incidence of gastrointestinal stromal tumors. In terms of indication, the report projects that a majority of treatment and diagnosis for gastrointestinal stromal tumor will be directed to remove the tumor from the stomach. In 2017, nearly 60% of revenues procured in the global gastrointestinal stromal tumor market will be accounted by stomach indication. With developments in clinical practice guidelines, the treatment of gastrointestinal stromal tumor is largely executed in hospitals. Extended post-treatment hospitalization period and high morbidity of GISTs continue to fuel the presence of hospitals as end-users in the global gastrointestinal stromal tumor market. By the end of 2026, over US$ 480 Mn worth of revenues will be generated from treating GISTs in hospitals across the globe. Over the forecast period, specialized cancer treatment centers will also emerge as a leading end-user in the global gastrointestinal stromal tumor market. Treatment of gastrointestinal stromal tumor is multidisciplinary, entailing the involvement of medical oncologists, surgeons, radiologist, as well as pathologists. Until now, the role of radiotherapy in treatment of gastrointestinal stromal tumor remains decisively unestablished. For being inoperable, patients suffering from this malignant tumor opt for symptomatic treatments such as conventional chemotherapy. The study projects that over the forecast period, chemotherapy treatment of gastrointestinal stromal tumor across the world will register a strong revenue growth, reflecting a CAGR of 6.3%. Leading pharmaceuticals companies and medical device manufacturers are actively partaking in the global gastrointestinal stromal tumor market, consolidating its expansion through 2026. Although, the current competition backdrop in the global market for GISTs witnesses the presence of only handful of companies, namely Novartis AG, Sun Pharmaceutical Industries Limited, Pfizer Inc., Bayer Aktiengesellschaft, and NATCO Pharma Limited. These companies are mostly based in the US and Europe. The study further anticipates that by 2026, North America will represent the largest market for gastrointestinal stromal tumors. Unhealthy dietary lifestyles, growing use of food additives, and prevalence of genetic disorders will be mainly responsible in driving the growth of North America’s gastrointestinal stromal tumor market. During the forecast period, the gastrointestinal stromal tumor market in North America is estimated to grow at a CAGR of 6.9%.